Currently, the Sun, Neptune, and Mercury are all in the intuitive sign of Pisces, but Mercury which rules thinking is in its shadow phase and preparing to retrograde in four days. Bear in mind Pisces is also known for dreaming and wishful thinking and fantasizing, all well and good, if you can keep your reality sorted. In other words, do not try to convince yourself of something which is really your dream, rather than your intuition. If someone, or something, has failed you nine times, do not lead yourself to believe that this time will be different simply because you wish it to be so. There is a fine line which distinguishes all of these things, and being honest with yourself is probably the best way to come up with the answers. Listen carefully, think it over, and act in your highest and best interest. This entry was posted in Card of the Day, General Tarot, Readings, YouTube Videos and tagged Card of the Day, Guidance, High Priestess, Path, Reading, Tarot. Your intuition is powerful right now. Listen to what you are feeling and have trust that it is guiding you in the right direction. 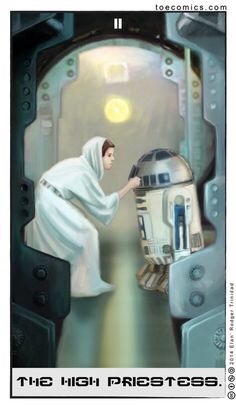 This entry was posted in Artist, Deck Review, Featured Card of the Day, General Tarot, Readings and tagged Guidance, High Priestess, Path, Reading, Tarot. Inanna was the ancient Sumerian goddess of love, fertility, and also of war. She was the daughter of Enki, the god of wisdom and magic, and the twin sister of the sun god Utu- Shamash. According to the legend, Inanna brought knowledge and culture to the Sumerian city of Uruk after taking it from Enki while he was drunk. She even descended to the underworld to gain new experience. In the time when religion was science, only priests and priestess obtained and kept knowledge, and Inanna supposed to be the High Priestess. The High Priestess typifies wisdom, knowledge, and awareness. She is a wise woman, full of modesty and discretion. The High Priestess is eminently secretive, mysterious, and intuitive woman. Understanding all things, she expresses her knowledge selectively. Applying intuition, being open to the imagination and seeking guidance from within, the she trusts the inner voice to understand and estimate possibilities. This entry was posted in Artist, Deck Review, Featured Card of the Day, General Tarot, Readings and tagged Artist, Guidance, High Priestess, New Babylonian, Reading, Roxana Paul, Tarot. Intuition, meditation, sacred knowledge, dreams, calm, receptive, channeling, solitude. The keeper of sacred knowledge, Lynx balances invisibly from the conscious and unconscious worlds. She knows that all which is hidden will one day be revealed, and that truth will eventually surface into consciousness. Her clairvoyance and divine wisdom will encourage you to embark on your sacred inner journey. Look within and trust the calming rhythm of your intuition, for it will eventually open the doorway to knowledge that will help you recognize your spiritual power. 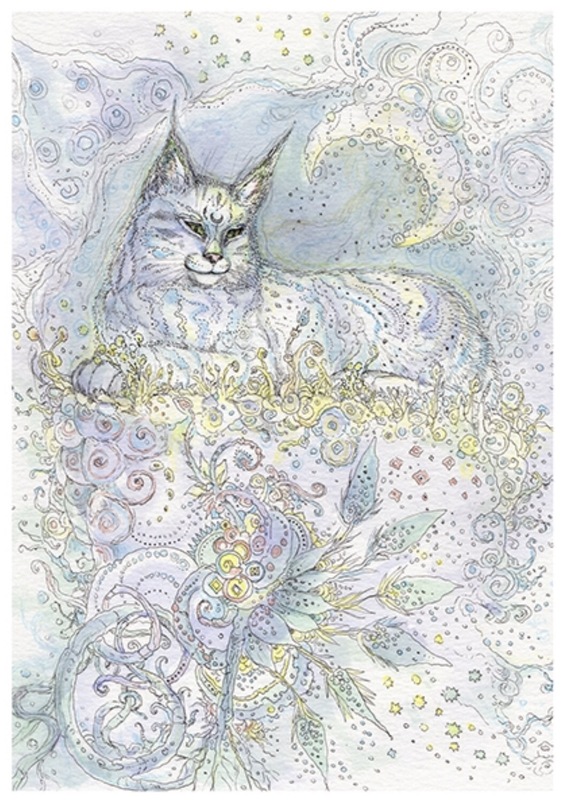 This entry was posted in Artist, Deck Review, Featured Card of the Day, General Tarot, Readings and tagged High Priestess, Lynx, Paulina Cassidy, Spiritsong, Tarot. May the 4th be with you today, as Mercury leaves shadow and the road ahead is much clearer, at least for the next week or so. This is a great day to consult with your inner voice, or intuition, if you will, to help guide you toward what comes next. Try to apply this High Priestess today in the realm of hindsight being 20/20, for the past is not a place meant to be revisited. Understanding how you arrived here will help you to determine what steps are necessary between now and September. Whether you realize it, or not, you are currently in the midst of a critical juncture. You may wish to emplore the all-seeing, all-knowing, High Priestess, to show you what is to come, but, honestly the road ahead is not a straight one. If you follow my in-depth, lengthy, special Tarot Guidances, then you are aware of the numerous energy shifts which are to come. Knowing where you have been will help guide your intuition over these next few life-altering months. This entry was posted in Card of the Day, General Tarot, Patreon, Readings, YouTube Videos and tagged Card of the Day, Guidance, High Priestess, Path, Reading, Tarot.